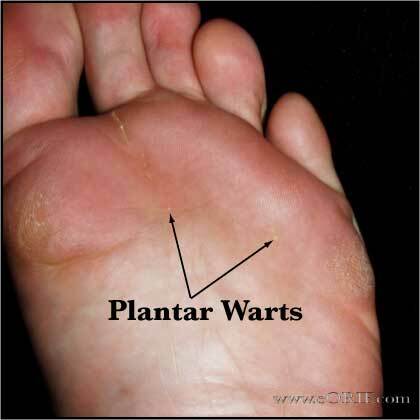 painful, discrete raised lesions, hyperkeratotic occuring anywhere on the plantar aspect of the foot. Generally in ares of pressure such as the heel or ball of foot. 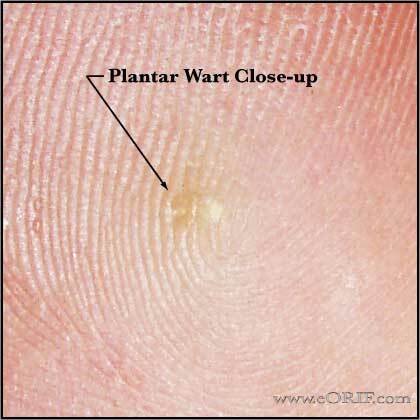 Warts are highly vascular, exhibiting dark end capillaries or punctate bleeding when shaved. Etiology: Human papillomavirus (HPV), usually of type 1, 2, or 4. Affects @10% of the population. Associated with use of public showers (Johnson LW. J Fam Pract. 1995;40(2):136). Generally endophytic growing into deeper layers of skin starting in the epidermis.. Painful hyperkeratotic lesion of plantar surface of foot. Pain increase with weight bearing / walking. Salicylic acid, cantharidin, dichloroacetic acid or liquid nitrogen cryotherapy. Treatments should always be preceed by soak the affected area in warm water and pareing away the top excessive keratin layer. Repeat applications are often needed every other day for weeks.